Sliman Mansour and the struggle for Palestine. 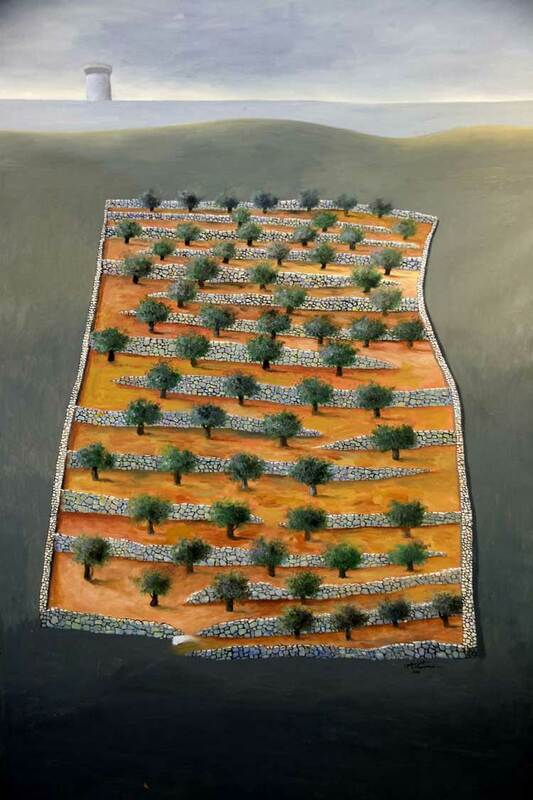 Sliman Mansour is a Palestinian paintor and sculptor. 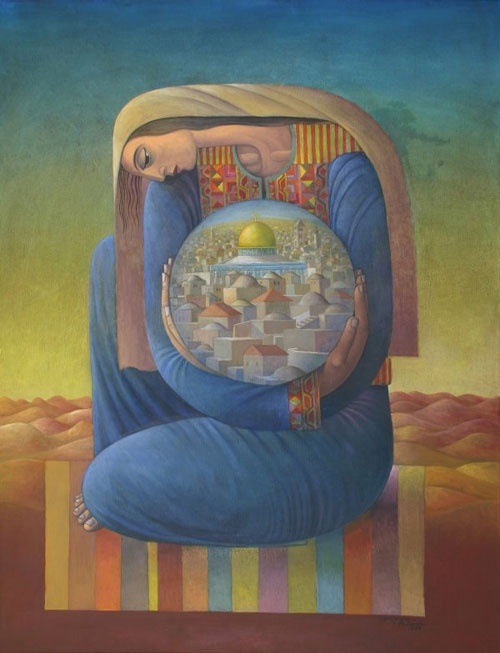 Mansour is considered an artist of the intifada whose work gave visual expression to the cultural concept of sumud (sumud – steadfastness or steadfast perseverance, an ideological theme and political strategy that first emerged among the Palestinian people through the experience of the dialectic of oppression and resistance in the wake of the 1967 Six-Day War). He first came to prominence for his surrealist masterpiece, Camels of Hardship in 1973. 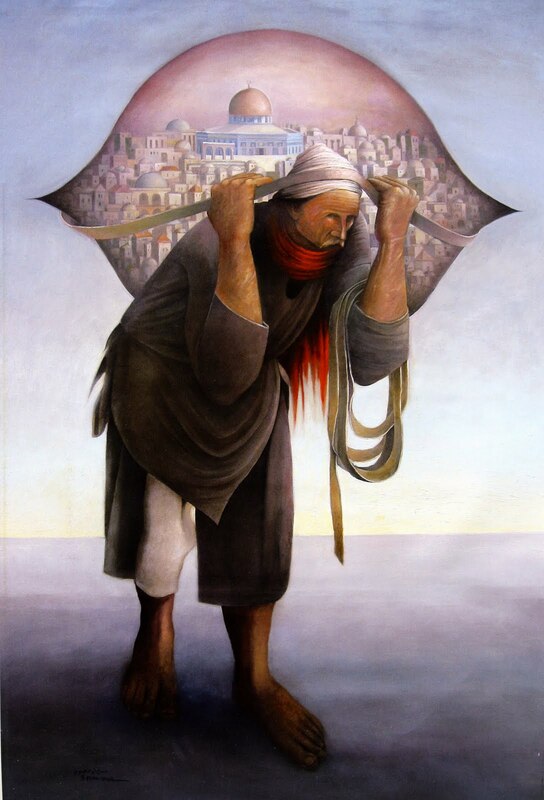 The Dali-esque image of a Palestinian peasant struggling under the literal weight of dispossession has become a classic of its kind, and became the launch pad for a career that would be defined by original approaches to representing the struggle for his homeland. Identified as a subversive by Israeli security forces, Mansour was plagued with harassment. In 1981 at Gallery79 (during the Intifada), an exhibition was closed after only six hours and he was arrested. “They told us we are not allowed to use red, green, black, and white in our works,” he recounted in a later interview. Such treatment was to be a recurring theme of a career that was regularly interrupted with jail time. While his work would prove influential enough to be exhibited in over a dozen countries and four continents, and win such prestigious prizes as the “Nile Award” at the 1998 Cairo biennial, Mansour was never content with merely producing artworks. In addition, he sought to inspire a revolution in Palestine that would bring a new generation of artists capable of communicating creative messages to the world. With this intent, he co-founded the International Academy of Art in Palestine, as well as the Wasiti Art Centre in Jerusalem. Both institutions have gone on to become prestigious names, teaching and exhibiting some of the region’s finest artists. Mansour’s creativity and determination to revive Palestinian identity has led him through a diverse range of disciplines, including cartoon drawing and authoring two books on Palestinian folklore. He is also a member of the “New Vision” art group which seeks to promote the use of local materials in the spirit he pioneered. For more, listen to Mansour introducing his work for Alhoush, and read a good interview here. → The hill that the women built, Afghanistan. ← Batniji’s Palestine: Suspended time, suspended reality.